If you’d like to explore yoga with me, here’s some background on my love for yoga. Excuse me if this looks like a Brag Page (yikes, there’s a lot of “I did this” and “I’ve done that”). I hope instead that you see it as some info on my yoga path, so far. 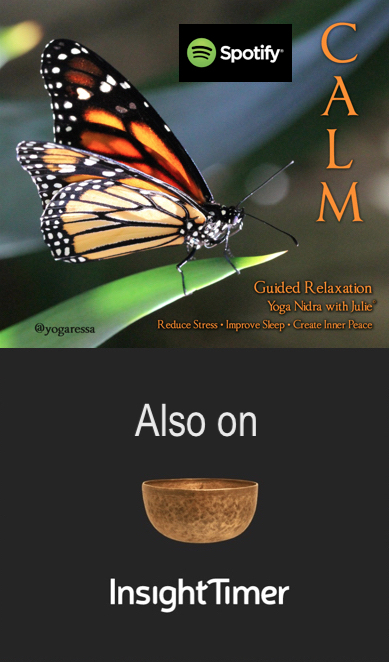 I’m best known for my Yoga Nidra guided meditation work—it is truly my calling. It’s a joy to see thousands of people benefiting from my recordings on the most popular global meditation app, Insight Timer. 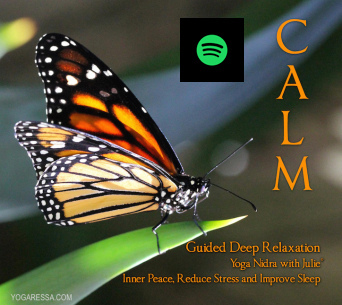 You’ll also find me as Julie Yogaressa on Spotify, Amazon, YouTube, Apple Music, iTunes, Google Play, CDBaby, and featured regularly on Yoga Digest). I’ve taught mindfulness, meditation and yoga to over 15,000 students since 2007— for large groups or private tuition, in yoga studios, corporate offices, recovery centers, yoga for veterans, and sunrise yoga beach settings. Yoga pretty much anywhere. Yoga retreats are a fun way for me and fabulous fellow yoga teacher, Karen Pagano, to host groups in exquisite destinations; co-creating transformative experiences which last long after returning home. I’ve been fortunate to study under many of the “big name” international yoga masters, yet I remind myself of the statement, “the Guru resides within“. 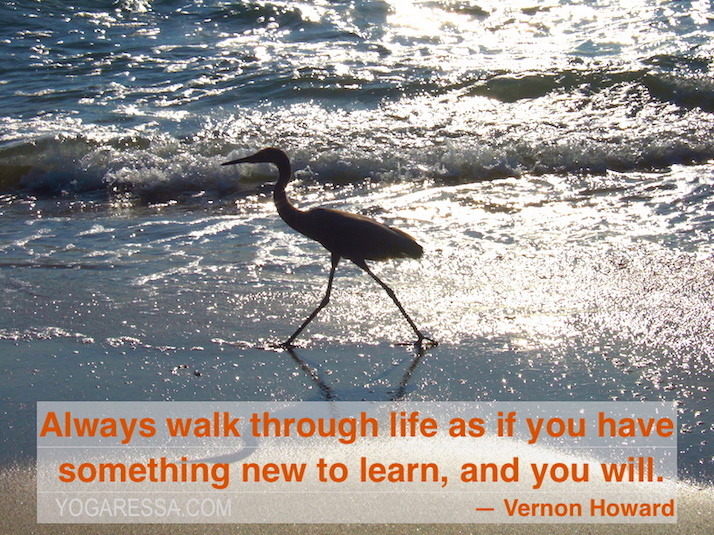 I am grateful for all my yoga mentors and am particularly fond of Betsey Downing, Jaye Martin and Yogi Sivadas. Students in my classes are often my best teachers, as I gain insight from every class I teach. I give presentations and talks at yoga and meditation events and workshops, such as The Yoga Expo in Florida, USA, and various other health and wellness forums. There are some 9,000+ hours that have gone into my yoga and meditation training and practice. I am passionately curious about this vast subject, and I will always have a desire to learn more; it’s vital for my continued growth as a yoga educator. I teach across the spectrum — from chair yoga and restorative yoga, to slow and mindful flow, and a blend of Yin/Yang Fusion. The Anusara and Iyengar styles provided me with a foundation of alignment and intelligent sequencing, and I’ve added other yoga methods over the years … anything that creates ease in the body, quiet for the mind, and a smile on the face. In my personal yoga practice, I enjoy the increased flexibility and awareness of body, mind and spirit, and my wish is to share this experience with others. May your yoga adventure bring you inner peace, joy, and a ton of laughter.